Chris is a businessman, with ambition and understands he faces an uphill battle, but with your help, nothing is impossible. Your vote is all I ask for. I’m personally tired of paying more and more taxes and having very little left. It’s time to put money back into the pockets of tax payers and bring our states out of control budget under control. Chris is a free speech activist. In January of 2018, Chris was attending a court hearing and was illegally detained after the law firm of Hall Estill called in a false threat, working in conjunction with The University of Tulsa. Chris was attending a hearing where he had sued Tulsa Community College for violating the Oklahoma Open Records Act. The lawsuit is ongoing. Chris responded to the illegal actions of Hall Estill, Johnathan Rogers, John Patrick Cremin and The University of Tulsa. Chris authorized his attorneys to file suit against the parties responsible for calling in this false threat because they did not like what Chris had to say. Within 24 hours, Chris’ attorneys filed suit against Johnathan Rogers, John Patrick Cremin, The Law Fir of Hall Estill and The University of Tulsa. As if that wasn’t enough for this group of corrupt fools, one of their attorneys, John Lackey went on to ask the court for a gag order, but it was really a prior restraint. The Federal Court in Tulsa ruled in my favor and reaffirmed that we have free speech, even if The University of Tulsa and The Law firm of Hall Estill are Anti-American and don’t support it. I’ve fought hard for free speech and I’ll continue to fight hard not only for myself, but for everyone. I would like to see those involved in calling in these false threats prosecuted. The entire section reads like an angry blog post rather than a promise to protect constituent free speech. What’s more, the personal story (and potentially his campaign for office) may be connected to a set of legal issues involving harassment, lawsuits and two institutions of higher learning: the University of Tulsa and Tulsa Community College. His recent alleged comments about SNAP program users do not appear connected to these incidents, however. In one of several polls posted to his campaign’s Facebook page, Barnett asked, “Should a person be required to apply for 2 jobs a week if receiving Food stamps and take any job offered to them to gain employment and if they refuse, they lose their food stamps?” He offered to potential responses: (1) Yes, no jobs, no stamps and (2) No, free food stamps. The question ties back to his taxes and spending views spread throughout his campaign website. 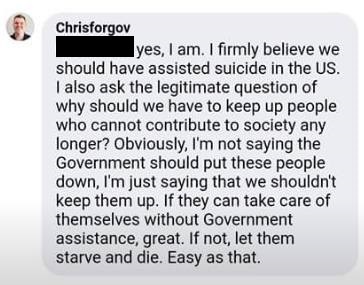 I firmly believe we should have assisted suicide in the US. I also ask the legitimate question of why should we have to keep up people who cannot contribute to society any longer? 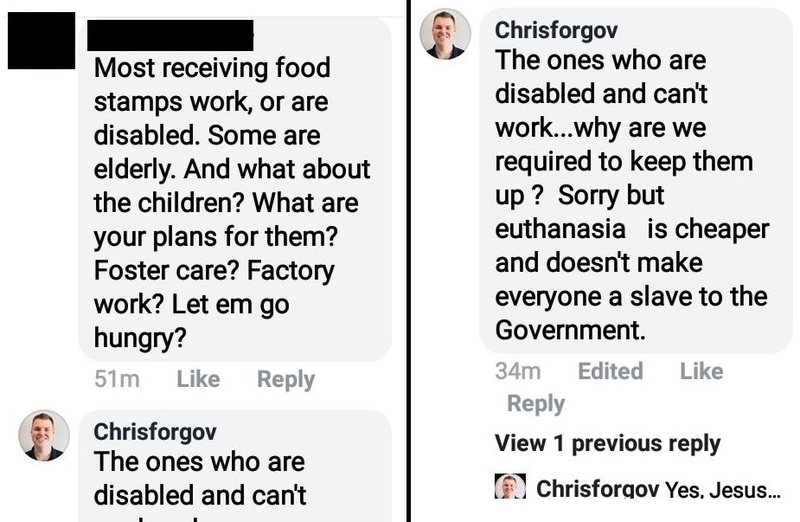 Obviously, I’m not saying the Government should put these people down, I’m just saying that we shouldn’t keep them up. If they can take care of themselves without Government assistance, great. If not, let them starve and die. Easy as that. Unfortunately, these aren’t the only outlandish questions and views posted to his page. Playing on Trump’s “America First” slogan, Barnett’s campaign slogan is “Oklahoma First.” The allusion to Trump’s slogan isn’t the only similarity between the two men: throughout his Facebook page, Barnett offers a host of unpopular and sometimes legally questionable positions, ideas and propositions. From demonizing undocumented immigrants to instituting drug testing to access social safety net benefits (a practice that’s costly, ineffective, and potentially unconstitutional), Barnett appears to have views both outside the mainstream while coinciding with a good portion of what Trump’s GOP stands for. That said, even given his litigious history and peculiar reasoning for entering the race outlined on his website, it’s not outside the realm of possibility this stunt is the work of an outside party. “We just published a statement on the website. Facebook is at again. They are trying to sway another election. I have not had any access to my Facebook page for several days. When this took place, myself, nor my husband were even remotely on the internet or even our phones. We were celebrating mothers day, all day long with our family. Thank you Facebook. Facebook needs to have a dedicated team to help its victims who have been compromised and pay a special level of attention to political candidates because timing is everything. Facebook, are you going to pay for my continued security detail? It is sickening what has happened to me running for office. My husband, nor myself have not been able to access Facebook and they have done nothing about it. We will not use Facebook any longer. To anyone that tries to make good on your threats to kill me… please don’t. Thereafter, a handful of paragraphs appear to be copy-and-pasted from Facebook statuses from the campaign webpage. While the explanation could certainly be true, some things don’t add up. For starters, having a gubernatorial candidate’s social media ‘hacked’ to promote abhorrent messaging should be reported to law enforcement – if not local police, the FBI. Especially in the post-2016 online world knowing what Russian hackers did and are capable of. What kind of gubernatorial campaign would silently allow several days to pass after a social media breach in which a third party made such abhorrent claims? What took them so long to come forward – and even then, only after the comments began gaining media attention? At no point did the Barnett campaign actually address a direction question relating to the controversial remarks associate with their campaign . Whether his Facebook page actually was hacked or the extremist comments were a backfired publicity stunt is still unknown. After speaking with us yesterday, Chris Barnett conducted an interview with KFOR – Oklahoma News 4 where he expounded on the remarks his spouse initially relayed to us via email. Click through for the full interview. And what to do about lawmakers that steal from the poor? How about hang them by the neck? The poor have had everything stolen from them, hang the ones responsible. I wonder how he would react to a poor person coming up with the idea of “euthanasia” for all politicians?, starting with this flaming POS! Wow, click on his campaign site…jumpin’ jimminy crickets. Now he’s saying he didn’t say that. Either way, he sure sounds like a spun monkey. He and his “husband” claim to be christian homosexuals. He has come out and said not true, here is a link. I sure hope it is fake, the first one was from RAW Story which is very left. Got me thinkin’ about poverty and how often the victims are blamed. Poverty is planned, and symptomatic of a sick society. The earth, if managed properly and with respect, will take care of its own. It’s greed, and its stepchild, control, that poison the well. I wonder if anyone’s ever met a severely impoverished Jew. There was such a thing in old Israel 2500, 3000 years ago. The Lord used a miracle and fed several of them. Not so much now though…. Unless they have been ousted from the clique. I can’t even believe this human feces pile was allowed to say this without being crucified. This idea of his should help with slimming down the illegal aliens and refugees. If they take back all the money those corrupt politicians stole and bribes they would be poor and off they go too. Most towns and cities just buy their poor a one way ticket to San Francisco. Should the government not euthanize the wealthy, and take their money, instead? ?